BOSTON, MA -- The Eastern Hockey League Premier (EHLP) resumed play this past weekend with 13 games over the 3 days. With 12 of the 13 teams hitting the ice, there were once again plenty of worthy candidates for our weekly honors. 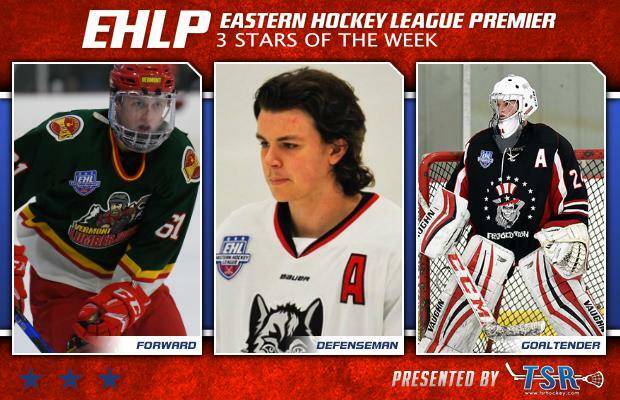 The EHLP is pleased to announce that Dave Tremblay (Central Penn Panthers), Jake Houk (Philadelphia Revolution), and Connor Carbo (Vermont Lumberjacks) have been named the TSR Hockey Stars of the Week. The action continues with 14 games on the docket from Wednesday to Monday. The next set of TSR Hockey Stars of the Week will be released on Tuesday, January 16th at 10:00am. Catch the EHLP action all season long on HockeyTV. Last month's TSR Hockey Forward of the Month, picked up right where he left of as Tremblay and the Panthers split their two games this past weekend. On Saturday, the 2000 born forward led the way with a hat-trick and an assist in his team’s 5-4 victory over the Philadelphia Little Flyers. Tremblay also picked up a goal and 3 assists in his team’s losing effort the next day, giving him a total of 8 points for the weekend. 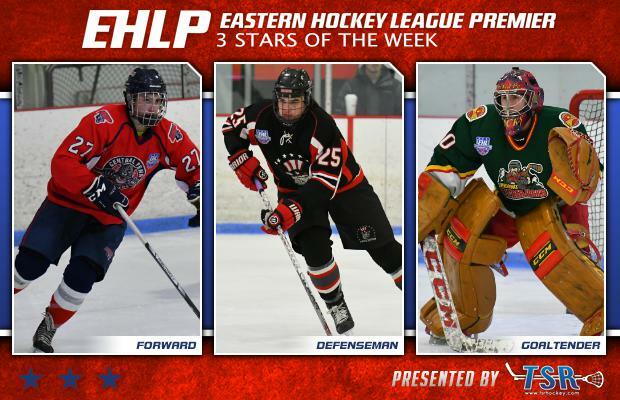 This is Tremblay’s 2nd weekly honor (TSR Hockey Stars of the Week #7) this season, as he is currently the EHLP’s leading scorer with 62 points on the year. The Panthers will get back to work with just 1 game this weekend, as they hit the road to take on the New York Applecore on Sunday. Houk and the Revolution won all 3 of their games this past weekend, extending their winning streak up to 5 games. The '99 defensemen led the way on Friday with a hat-trick against the New York Applecore. The Pennsylvania native then added 3 assists to his weekend totals in his team’s 9-4 win against the Central Penn Panthers on Sunday, to give him a final tally of 6 points for the weekend. Up next for the Revolution is a matchup on the road against the Philadelphia Little Flyers a week from today. Carbo and the Lumberjacks won both of their games this past weekend against the Walpole Express. Carbo was between the pipes for the victory on Sunday where he stopped 32 out of a possible 33 shots, to lead his team to a 4-1 win. The '99 is now 12-3-0 on the season with a solid 2.51 GAA and a .915 save percentage. This is Carbo's 3rd weekly honor (TSR Hockey Stars of the Week #3 -- TSR Hockey Stars of The Week #10) this season as he continues to be a rock for the 1st place Lumberjacks. Up ahead for the Lumberjacks is a game on the road this upcoming Wednesday against the Valley Jr. Warriors. The EHLP would also like to recognize a pair honorable mentions this week, starting with JoJo Velasquez. The 2000 defensemen stood tall on the blue line this past weekend for the Philadelphia Revolution, collecting a goal and 4 assists in his team's 3 victories. Geordan Buffoline of the Vermont Lumberjacks notched 3 goals in 2 games against the Walpole Express this past weekend. The '99 leads his team in the point category with an impressive 51 so far this year.